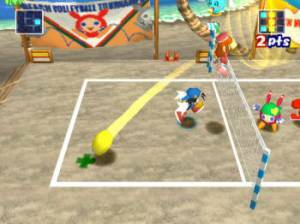 SUPER Volley ball is an indoor volleyball game for one or two players. 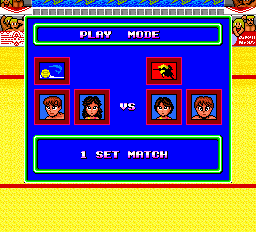 The single player mode offers two game options: normal game and World League. 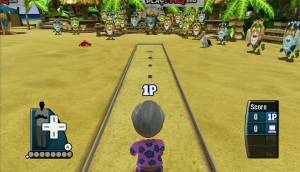 Choosing normal game pits the player against the computer in a single game. Choosing World League pits the player against all other teams available. A password save is available in this mode. 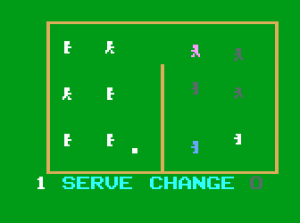 The game features eight national teams (USA, USSR, Brazil, Holland, France, Italy, Japan and China), with fictitiously named players. Players can be changed during gameplay by pressing C. There is also an option to create new teams, choosing the team's name, color, player's position and names.